SUPER-LIKE!!! Enlisting my students to get start tomorrow!!! Makes me think of Vi Hart and her “doodling in math class” videos – great stuff, love the idea of getting into the hands of “little people who are deciding right now if they like math…” critical time, and we can make a difference. Great share – sending it on, and on, and on to teachers, students, and families! Can families enter? We don’t have 40 kids in our “class,” but we can probably find 40 friends to share books with if we happened to win. For sure! Lots of love for homeschool families here. Someone’s got the Brit edition! Ok, I made a Scratch version so that you can experiment with designs before you commit to painting your epic loop. Some higher math loop-de-loops here! This is an interesting old problem. You can see a java version of this activity at http://www.ciese.org/ciesemath/spiros_s.html. I love the patterns that each set of numbers can generate. I plan to use this in my classes (grades 3-6) to see if my students can predict what kind of pattern (overlapping, adjoining, or more of a windmill design) based on the numbers they choose. Thanks! Paul Lawrence called these “Spirographs” in his Data Analysis and Discrete Math series. 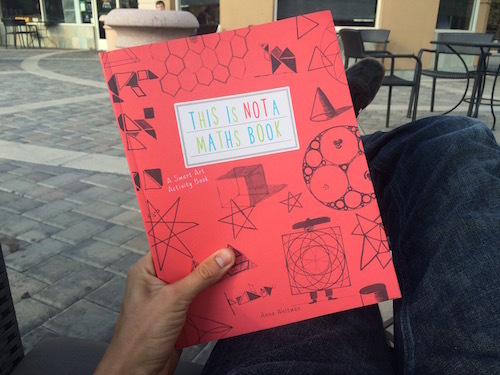 He used it as a way to teach geometric iteration. I particularly find the second one fun to run, with some fascinating surprises. For example, one sees a lot of busy stars when the turn angle is 180 * 5/7. Then, suddenly the figure generated by that turn angle and steps 6,6,3,9,8,8,1 pops up and is a big surprise (to me, at least). Thank you for sharing this project! 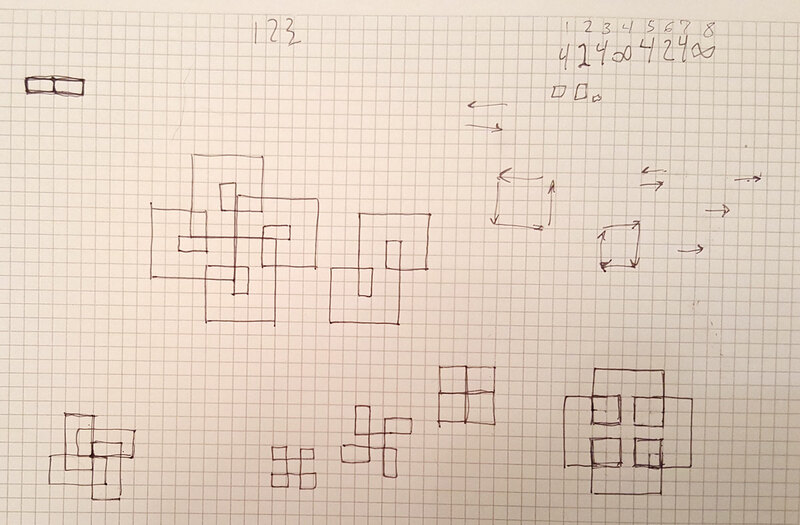 My teen daughter had fun investigating the patterns and came up with an original proof, which I will try to share. It’s not quite the sort of thing you asked for, but I hope you’ll enjoy it. Choose a sequence of numbers. Consider that sequence as describing a vector from A (the starting point) to B (end of the first repetition). Then the chart shows how many copies of that vector will create the final spirolateral pattern. There are four possibilities, shown by the vector arrows on the paper. (1) A sequence that has 1 mod 4 numbers will repeat four times, in a squarish pattern turning the same direction as the spirolateral turns. That is because the last line of the sequence points the same direction as the first line, so the vector for the second repetition will turn 90° from the first vector. (2) Similarly, a sequence that has 3 mod 4 numbers will repeat four times, but its squarish pattern will turn opposite the direction of the spirolateral. The vector for the second repetition points -90° from the first vector. (3) A sequence that has 2 mod 4 numbers will repeat twice, because its second vector points 180° from the first. (4) And a sequence that has 0 mod 4 numbers (as long as it actually has numbers) will spiral off into infinity, because the vectors for each repetition always point the same direction. With some sequences, the repetitions will end up drawing on top of each other. For example: 1-2-1-4-1-2 in the top left corner, a 6-number sequence that looks like it only made one copy of the pattern. But because the direction of the vectors is different, there are really two different copies of the pattern, overlaying each other. (5) A sequence that has 0 mod 4 numbers, if it’s long enough, can be arranged so the last line ends exactly at the starting point. In that case, one copy of the sequence has completed the pattern. Since the second repetition starts out in the same vector direction, it will just go around and around on itself. @Denise: can you tell when a sequence of length 0 mod 4 will close up and when it won’t? I can provide a hint, but don’t think your daughter will need it. Good question, Joshua. Thanks! It will make her think a bit, but you’re right, she won’t need a hint. Love this book! When it was announced as a new title at our National Convention, everyone in the hall squealed. I have dozens arriving tomorrow for a gifted conference and cannot wait to see their response. LOVE that you held this as a contest. Denise, thank you for your proof but I don’t understand it. I know some basics of modular arithmetic but don’t understand what you mean by 0 mod 4 numbers or 1 mod 4 numbers, etc. I know a 5, 4, 3, 2 sequence will diverge but a 5, 4, 3 sequence will converge. I would like to understand the proof of being able to predict the behavior of sequences. Explain it as simply as you can, please. Thanks! The modular numbers are a short way of talking about multiples and remainders. 0 mod 4 means the multiples of 4 (remainder 0 when divided by 4). 1, 2, or 3 mod 4 mean the numbers that have those remainders when divided by 4. It’s a useful shortcut when talking about things that occur in cycles. The 5-4-3-2 pattern has four numbers, so it’s a 0 mod 4 pattern. As you repeat the pattern, each new iteration starts pointed in the same direction as the first one, so it never comes back around. It diverges. But the 5-4-3 pattern has three numbers. Each time you repeat, the first line is pointing in a different direction, and after drawing the pattern four times, you have come full-circle back to your beginning. My daughter’s proof is based on seeing the sequence as a roundabout way to describe a vector from point A (start of the sequence) to point B (end of the sequence). With 4-number sequence (or multiple of 4), the vectors all point the same direction, and the patterns walk off into the distance. But with the other sequences (not a multiple-of-4 numbers long), as you repeat the patterns, the vectors take a “walk around the block” and come back to where they started. whether the vectors “walk” clockwise or counterclockwise and how many iterations it takes to come back to the beginning can be predicted by looking at how many numbers are in the sequence — and particularly, at the remainder of that number when divided by four. Thank you Denise. So you’re saying it is as simple as any sequence that has a multiple of 4 numbers in the sequence will diverge and all others will converge? I was thinking that the lengths involved were important but really it is more about how many numbers are in the sequence and not how long they are? So cool. So as a separate issue, what CCSS math standards does this exploration support? I’m thinking of sharing this with teachers and it seems strong in art and technology (computer programs the model the sequences) but not so strong in the math standards. For my daughter’s investigation, yes, it didn’t matter which numbers were used, only how many were in the sequence. Although if you choose the numbers carefully, you can tweak the appearance of your loop-de-loop. For instance, we found one 6-number sequence that *looked* like it only had one repetition in the final pattern, instead of two as predicted by the proof. That was because the second iteration went back over all the same lines as the first, but did them in a different order. It was 1-2-1-4-1-2. And we found that an eight-number sequence (or other, longer multiples of four) can be chosen so that it comes back to the starting point at the end of the first sequence pattern. Then, because it starts the next sequence in the same direction, it will keep going around the circle rather than walk off into infinity. As a homeschooler, I haven’t had to study the CCSS, so I can’t answer that question. For my dd, there was plenty of mathematical reasoning that involved modeling, vectors, cyclical functions, modular math, multiple representations, and justifying her statements. YMMV. wonderful book. I bought it for my sons published in Polish version.